Greece – is there a better time to visit? The Aer Lingus flight to Athens had just over 100 on board, light for the beginning of June. We departed mid afternoon from Dublin and in just over 3.5 hours were descending into the heavily mountainous terrain that surrounds Greece’s capital city. 2 hours ahead of GMT, Athens was in the clutches of a warm, dusky twilight, the pervasive white and density of its buildings contrasting with the growing blackness and shade of the surrounding vegetation. Our checked bag was delivered in less than 10 minutes to an airside baggage hall that was uncharacteristically ordered and calm. Angela’s car was parked kerbside and minutes later we were cruising easily towards Vouliagmeni with no evidence of the snarling traffic usually associated with the city. Recession, austerity and crises are certainly impacting on life here and it makes it easier than ever to get around. Angela arranged accommodation at The Margi, a contemporary 90 roomed boutique property, located on the “Athenian Riviera”, an airy maritime community mid way between the airport and the city centre. We enjoyed a delicious pool side meal and heard a little of the intriguing history of the Margi from present CEO and family member, Theo Agiostratitis. Now owned and managed by third generation Agiostratitis, the hotel is called after Maria and Gina, two daughters of the original patriarch. Theo has overseen a total re-imagining of the property and The Margi now presents as a very chic urban resort where you sit on white leather chaise longue, sip freshly made Mojitos and listen to David Holmes remixes – Oh, austerity, where is thy sting? Breakfast al fresco is long and leisurely and characterised by extremely attentive but not invasive service. Service staff wear casual, cool white linens and converse sneakers. We eat freshly prepared eggs and drink cappuccini as we ponder our week ahead. Nearby, 200m from the Margi, retirees do callisthenics in the warm waters of the bay, basking whale-like, in the bright mid morning sun. It could easily be Californina, not crises gripped Greece. Vouliagmeni, apparently, boasts a number of excellent hotels including two Starwood properties and an excellent Divani and, according to Angela, offers a very workable alternative to downtown Athens for meetings and events. We elect to fly Athens – Santorini and thus miss out on the magical approach to the island that those who take the various sea options experience. Having quickly negotiated the customary chaos that tends to reign at small island airports we soon find ourselves in a large touring vehicle hurtling at alarming speed along roads the width of a donkey cart. Formed, like most of the Greek islands, by intense pre-historic volcanic activity, the topography of Santorini is special and unique. Its footprint is half-moon shaped with the closed side of the crescent facing West into the Caldera of the ancient volcano. Parts of Fira, the island’s capital and Imerovigli, one of its villages, sit astride the high ridge and look directly into the tranquil turquoise waters which, eons ago, inundated the crater. Our hotel, the tiny, 10 roomed Heliotopos, occupies a perfect bird’s eye vantage point at Imerovigli affording us unsurpassed views of the Caldera and, most significantly, of the setting sun which, nightly, stages an awesome ballet for all to see. Heliotopos Hotel is one element in a portfolio of MICE products and services owned and managed by the Konstantinidou family. Before “Destination Weddings” became a niche within a niche, Lila Konstantinidou was harnessing the unparalleled assets and infrastructure of Santorini on behalf of brides the world over, seeking the perfect wedding. These days, with island numbers down drastically – the restaurateurs admit to 25% but it looked worse to us – destination weddings are on the increase as they often offer a more affordable alternative to a full scale traditional affair. Thus the Konstantinidous are now happily reaping the just rewards of their early insight and endeavours. Couples now travel for their special day to Santorini from the US, China, Japan, Russia and, of course, other EU countries. Lila is passionate about what she does and, impressively, recalls the names and the special stories of all the brides who appear in the pictures that she shows us. Clearly this is not just about business, it’s about the deep human satisfaction of helping to create and being part of the special moments in peoples’ lives. From our balcony we can see the tiny town of Oia attached like a limpet to the most westerly extreme of the island. The walk there is a 2 hour hike-and-a-half over two high outcrops, along rough tracks that hug the cliffside. Leaving Imerovigli you pass some stunning resorts, white cushioned sun loungers arranged symmetrically around azur blue infinity pools. Most are unoccupied. Further signs of economic turmoil are the half finished building projects, raised randomly in implausible places in days when it seemed there’d be endless demand. With beautiful irony these sites are now being gradually re-colonised by the magnificent native flora which, only a short number of years ago, they disturbed. You can stop mid way at a ramshackle shelter and buy freshly squeezed orange juice and homemade walnut cake. Located at a pinch point on the island the views from here are stunning – into the deep mystery of the caldera on one side or out onto the wide plain of the vineyards on the other. Oia is worth the walk and offers a slightly more upscale visitor experience than Fira, Santorini’s main town. A smooth marble pathway runs like an artery through the centre of the town with numerous pencil thin laneways branching out left and right in no apparent order. There’s a plethora of studios and galleries which range from local artists producing typical village scenes on timber fragments from old oak barrels to internationally renowned sculptors whose work is exhibited in New York and Paris. We find a small Antiques Store and buy a beautiful traditionally crafted wooden window frame. Three of the five restaurants on Santorini that came highly recommended to us – Pelekanos, Papagalos and 1800 – are located in Oia and we enjoy a simple, leisurely lunch of crispy pitta, local tomato balls with mint, baked aubergine and miscellaneous dips at Papagalos, renowned for its organic, farm-direct produce. Our lunch is accompanied by some very groovy and super cool Motown classics – Papa was a rolling stone, Just my imagination, Move on up etc – a happy relief from the ubiquitous eurovision / europop which greets us nearly everywhere else. 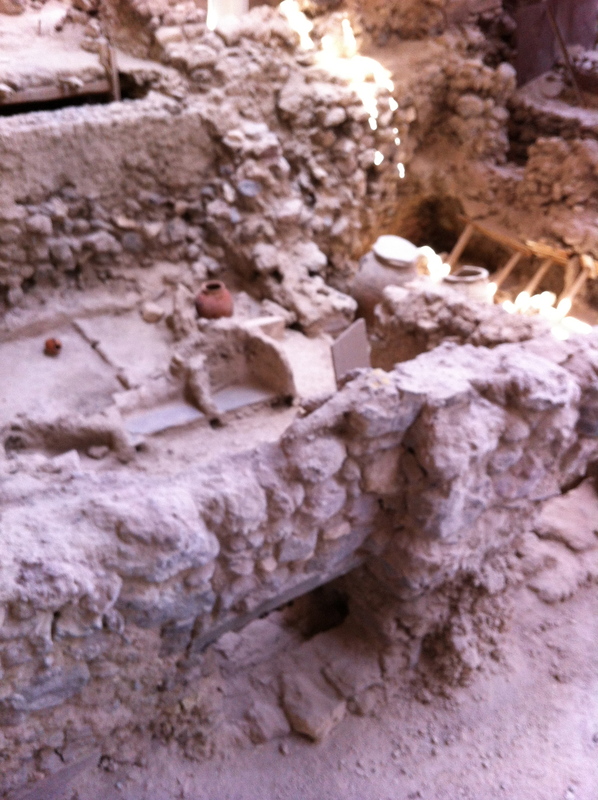 Given its importance and uniqueness in European history and heritage its hugely surprising that you only accidently stumble across the excavations at Akrotiri. 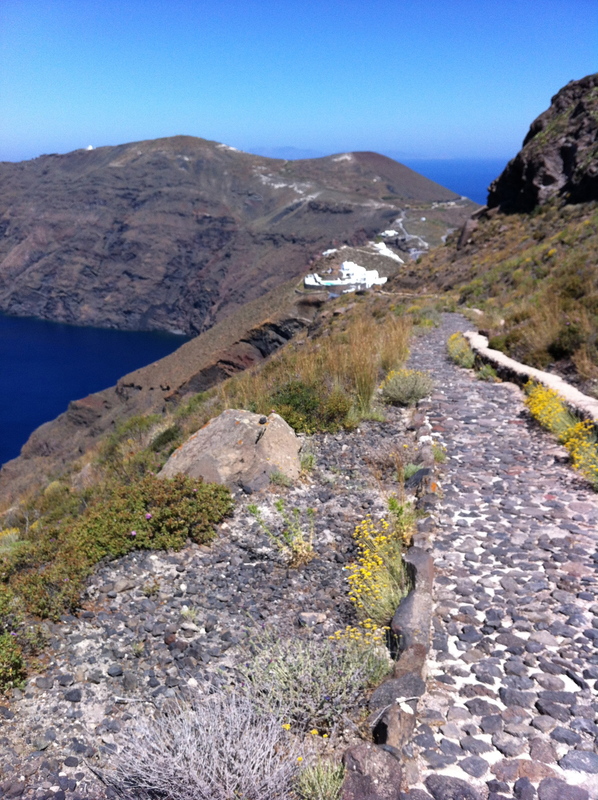 This archaeological site, along with the museum in Fira which houses the Kodak Pathe reproductions of its frescos, would be reason sufficient to visit Santorini. Re-opened in the past 5 weeks following a 6 year closure “for technical reasons” this site provides a perfect glimpse into a very sophisticated system and society from about 1500BC, the date when archaeologists tell us a massive volcanic eruption caused Akrotiri to be buried under a thick layer of lava. Today you can visit the re-opened site, housed entirely inside a magnificent new construction with an award winning bio-climatic roof that ensures the internal temperature is always pleasant and cool, despite the raging heat outside. The Kodak Pathe reproductions of the frescos, meanwhile, are displayed in a restored residence in central Fira. They are a stunning testament to the inhabitants of Santorini who, over three and a half thousand years ago, imagined such exotic creatures as Griffins – half lion / half eagle – and were able to depict full scale flotillas, intricate flora and fauna and young boys in playful combat. There’s nobody else in the museum when we visit. Close to Akrotiri you can find some spectacular beaches. Red beach is accessed either directly by boat or down a perilous precipice. Either way it’s worth it. The beach cove is protected by a red lava rock cliff face which contrasts with the turquoise water and the blue sky. This is your Mamma Mia / Captain Corelli’s Mandolin Greek dream. The beach is populated by a mix of gap year students in Dixie dukes and flip-flops, darkly handsome local youths, pale skinned, introspective Chinese honeymooners and the odd – yes, very odd- superannuated Italian Lothario with permed hair and speedos. What’s missing? A troupe of 3rd age Germans in lederhosen, heavy boots and walking sticks to march in quick formation across the expanse of the beach and execute a very efficient climb up the rock face. Initially we had difficulty locating “The Cave of Nickolas” the restaurant recommended to us by Lila. “There are 4 restaurants in a row. You have to go to the third one. Everything there is home produced and all the fish is fresh”. Eventually we find it and take a table on the outside veranda which is right on the ocean. Originally built as a shelter for Nickolas and his boat, a tavern was started here many years ago, on the suggestion of a Spiros Marinatos, lead archaeologist on the nearby Akrotiri dig. The rest, as they say, is history. 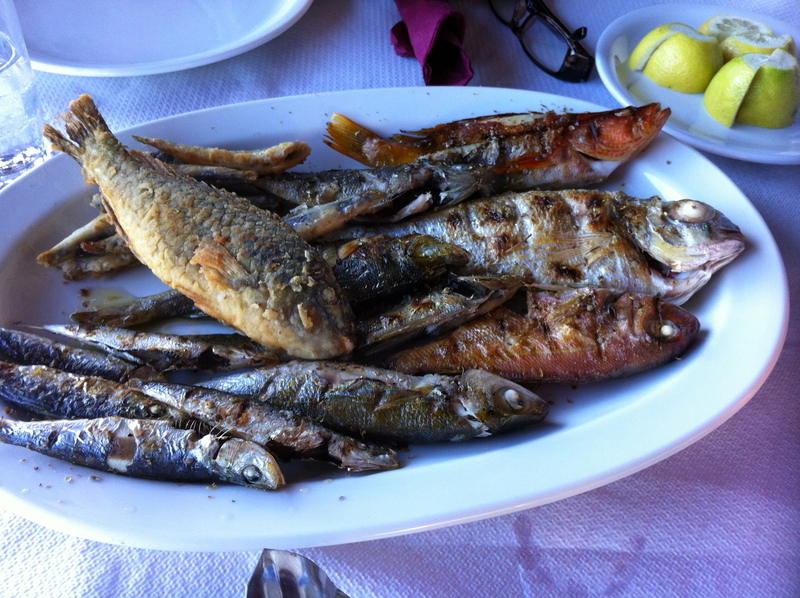 It’s a simple, rustic tavern but serves magnificent traditional cuisine – Fava, tomato balls, feta cheese, grilled vegetables and fresh fish grilled on hot irons etc. Padraic Gilligan is VP Industry Relations at MCI, a globally integrated association, communication and event management company 47 offices in 23 Countries. With Patrick Delaney he also heads up the Destination Services practice at MCI which is branded as Ovation Global DMC. Ovation’s strategic partner in Greece is Kipling Events. Owned by the inimitable Angela Kipling, a British citizen, fluent in the Greek language, customs and mentality, Kipling Events provides high levels of service and outstanding organisational standards with exceptional local knowledge for Meetings and Events throughout Greece and islands. Well, last year early June, me and my gal spent 14 days (yes it’s a lot, but we explicitely went there to relax) on Santorini, staying at the boutique Lilium Villa’s near Fira, facing the Caldera; obviously we went all over the Island, by cabriolet on some days, exploring all nooks and crannies of this beautiful island, just great off-season, and lounging on the black beach near Perissa. We also had lunch or dinner at many of the local restaurants (including Papagalos in Oia), did some wine tasting, took a few boat rides to the other islands, climbed th Volcano, and just had a great time. To sum it all up, the Greeks locals were absolutely great in their friendliness, service-minded, and overal attitude, which certainly helps us to relax and enjoy; well worth the money we spent ! 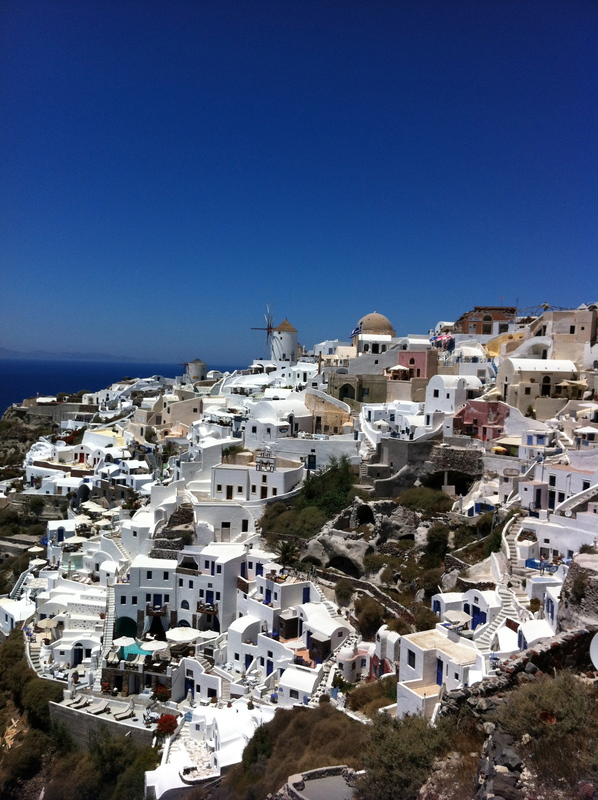 Jean-Pierre – many thanks for taking the time to record your impression of Santorini. It’s a really special black but it needs careful destination marketing – this will be the topic of my next post later today. I’ll look forward to receiing your comments on that too!